Take some time out from it all and enjoy a family break to treasure at Horizon Holiday Apartments Burleigh Heads. Set within lush tropical gardens, our 15 storey resort features everything you need for a relaxing break, from superb guest facilities to stunning views of the ocean and Gold Coast hinterland. Ideal for families, couples and groups of friends, our Gold Coast family resort comprises of fully self contained one and two bedroom apartments, each equipped with all you need to get the most out of your stay. 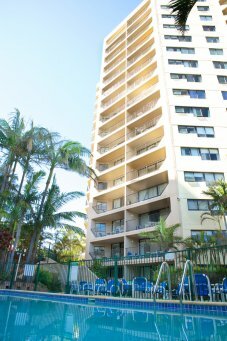 With an excellent selection of guest facilities, including a heated outdoor pool and spa, toddlers wading pool, sauna, games room and children’s playground, Horizon Holiday Apartments Burleigh Heads has something to make every guest’s stay one to remember. Soak up the renowned local sunshine and fantastic views on your apartment’s own private balcony - ideal for relaxed family breakfasts in the open air, as well as your evening glass of wine. Our Burleigh Beach apartments are located just seven minutes from the multi award winning Currumbin Wildlife Sanctuary, one of the Gold Coast’s most enduringly popular visitor attractions. Spend the day getting up close to koalas, kangaroos, wallabies and snakes and lizards of all kinds. Don’t forget to check out the famous rainbow lorikeet feeding times! Animal lovers of all ages will also want to check out the fantastic Sea World, a marine centre and theme park only a short drive from the resort. The attraction is home to the only polar bears in Australia, as well as sharks, sea otters, dolphins, penguins and a host of other sea creatures from the Pacific Ocean and all over the world. Book your stay at our holiday apartments Burleigh Heads today and start planning the ideal Gold Coast break now!